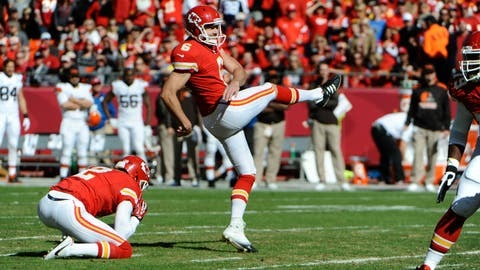 Special teams players Ryan Succop, Dustin Colquitt and others will need to bring their "A game" if the Chiefs want to advance in the playoffs. KANSAS CITY, Mo. — If Jamaal Charles is "Public Enemy No. 1," as Indianapolis coach Chuck Pagano termed it, then Colts punter and kickoff specialist Pat McAfee just might be Public Enemy No. 2. Consider this: The Kansas City Chiefs led the NFL in average line of scrimmage to start a drive (32.74), thanks to turnovers and, primarily, thanks to the league’s best return game. Against the Colts on Dec. 22, the Chiefs’ average starting position was their own 25 — about eight yards behind their usual season number. And there’s this: In their five losses, the Andy Gang started, on average, at their own 27. Throw out the Week 17 loss at San Diego — a.k.a. "The J.V. Bowl" — and the average start was at their own 26, a difference of roughly seven yards below the usual season mark. And there’s this, too: In the Colts’ five losses, the average starting field position of their opponents was the 28-yard-line, some two yards and change ahead of their season average (25.97). In other words, your serve, Dave Toub. Your serve. "We talked about this early on," the Chiefs’ special teams coordinator said earlier this month, "that the star of our unit is the unit. That’s kind of our mantra. It’s really helped the team this year." And, chances are, they’re going to need the special-teams star (or stars) to shine brighter than ever Saturday during the Andy Gang’s wild-card round rematch with the Colts at Lucas Oil Stadium. Much has been written about Toub and his assistant Kevin O’Dea, and with darned good reason: FootballOutsiders.com rates the aforementioned Chiefs’ units as the best in the NFL (over New England, Baltimore, St. Louis and Seattle); the folks at Pro Football Focus slotted them third in the loop, ahead of Seattle (No. 4) and Indy (No. 5) and behind only Denver (No. 1) and Carolina (No. 2). Whether by a sudden-change situation or a long runback, the Andy Gang led the NFL in drives started in opponent territory (38) and percentage of drives started in opponent territory (19.3). Meanwhile, the Colts have only turned it over 14 times in 16 contests, another league-best number. So, basically, the math says that if the Chiefs want user-friendly field position in Indy, they’re going to have to do the heavy lifting themselves. "That’s a challenge, I think, both ways, both offensively and defensively," Reid said Tuesday. "They’re efficient with the ball, they don’t have a lot of penalties that are called against them and they don’t turn the ball over much. That’s this time of the year; you’ve got to eliminate mistakes. Mistakes get magnified in the playoffs." Special teams get magnified, too, especially when quality teams in January start canceling out one another’s strengths. That’s a checkmark on the plus side for the Chiefs, who set a new NFL single-season kickoff return record with an average of 29.9 per runback, breaking the old mark of 29.4, set by the 1972 Chicago Bears. "We have some really good returners. We’re pretty blessed there," Toub said earlier this month. "We also have a lot of good players that are minded in everything we’re doing and are practicing hard. They’re making it happen on the field. "And once you score — and the same thing happened (at my previous job in) Chicago — it kind of feeds off itself. The guys really start buying in and they want to get them in the end zone. We have three guys that can do it and guys just block a little extra harder. It’s really paying off for us right now." "You go back to the fundamentals," Reid said, "and you’ve got to be sharp there." Of course, the Colts value those fundamentals, too: Indy wound up seventh in the NFL in lowest opponent average line of scrimmage to start a drive; 19th in the league in touchback percentage (46.59); and 12th in home touchback percentage (53.33). "We have to make sure that as coaches we are putting players in a good position and when you’re in a good position to make a play, you make a play," Reid noted. "That’s how this thing works at this time of year. Like I said, any mistake ends up being magnified in the playoffs, so you’ve got to have your ‘A game.’"
Your stars have to be aligned, in every phase imaginable. With teams this close, on paper, locking horns, the littlest things Saturday just might up being the biggest keys of all.